Some great storm structure, numerous funnel clouds, and even a brief tornado on this day. We started the day in Wichita, KS and headed towards Topeka with the intent of chasing the dry line once it lit up late in the afternoon. First we headed up to Emporia, and waited…. Then up to Topeka and the mall, and waited, waited, and waited some more. After two 30 minute waits at the mall, watching radar (and the tornado warned storm that was going on up in Nebraska on the true front), things started percolating on the dry line and soon we were in business. We headed west of town and found some high ground from which to observe the big updrafts exploding along the dry line both to our north and south. The storm to the south was coming into an area with better conditions, the one to the north the better wind shear. We spent about 20 minutes out in the open country watching the storms, and the horses in the field right next to us, then targeted the southern storm. We proceeded south and west of Auburn and stopped as the storm developed its first mesocyclone and wall cloud just to our west. The storm has fantastic structure and we were in the perfect position for great photography. As the meso slowly approached, the sky became a merry-go-round above us and three times we felt the surge in in-flow winds that often mean the storm is about to tornado. Several funnels reached towards the ground, but it never quite tornadoed. Eventually we had to move to keep up with the storm heading over to Rte. 75 and north towards Topeka, now with no less than three mesocyclones, the old dying one, the dominant one, and a new one out ahead, arrayed in front of us as we approached up the highway, where we stopped to observe again. We headed northeast on the turnpike with the meso hanging precariously low to the ground. As we went through the off-ramp of the turnpike near Grantville, the storm dropped several funnels in a few minutes, but again, would not tornado! Finally heading east out of Newman the storm got obscured in the trees to the north, and off in the distance we caught a very brief glimpse of a white stovepipe tornado over Perry Lake, which apparently did quite a bit of damage. By the time we got back on the storm, it had become a big HP beast, and though it almost surely had a tornado in it, the area of rotation was completely rain wrapped, so the show was over though the overall structure was fantastic. We paused to watch lightning for a bit then headed west of Topeka again for a dinner stop and an even better lightning show, and then proceeded south back towards the hotel in Wichita. On the way, we passed right along the flanking line of a violent storm to our east and were treated to another even better lightning display. 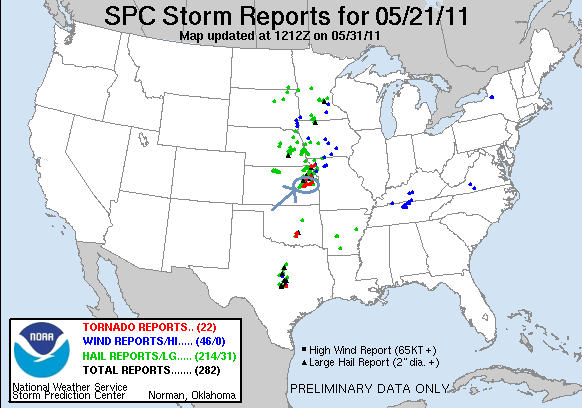 That storm was nasty looking on radar, and apparently did a lot of damage in Reading, KS where I later found out some fatalities had occurred. Mileage for the day was 425 miles. After quite a bit of waiting, storms fire to our west and we head out of the city to observe. Here's a nice storm to our north with a good looking anvil. We elect to chase the next storm to the south, pulling right up to the updraft. Nice looking back-sheared anvil! Mammatus developing under the leading edge of the anvil. We stopped just east of the updraft near Auburn. The first lowering begins to develop while a precipitation core opens to it's northeast. The storm begins to show a well defined mesocyclone and starts to spin like crazy! We could hardly have been in a better spot to watch this storm cycle up! Awesome structure! Updraft tilting off to the northeast with a big precipitation core out front. Mothership in progress! Merry-go-round area or rotation forms under the meso. 2-3 times the inflow into the storm really picked up, which is often the signal that it's about ready to tornado. Funnel develops! Made it about 1/2 way down then...... just sort of hung there! Passing very close to our north another funnel developing to the east of the first one. How did this not tornado!!? The second funnel gets more serious. Heading back northeast towards Topeka. The first meso (to the left) is dying out, while a new one forms just to our northeast. Near Grantville, the storm tries to spin up again. Big funnel forms right above us! NO tornado!!! C'mon!!! Seriously? Now east of Grantville. Blocky lowering just to our east. This storm would finally get it's act together and tornado over Perry Lake a little later but we only caught a brief glimpse as it was away from the road network. Pretty big hail! The storm became a big HP supercell. Awesome structure! Eventually we got cut off by the hail core and called it a night, pausing for lightning and a break near McLouth, KS.